Smalls jazz club entered the CD market in a big way in 2010, releasing a series of albums documenting live performances at this venerable Greenwich village institution. While Smalls Records already had a hand in showcasing the musicians and scene surrounding this club, Smalls Live is all about presenting the music as it happened on any given night in the club. 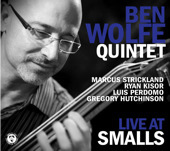 The label has already released a bounty of brass-lead sessions by the likes of trombonist Steve Davis and trumpeters Ryan Kisor and Jim Rotondi, but the first bass-directed date for the fledgling label arrives with Ben Wolfe's Live At Smalls. Wolfe is familiar to many listeners for his work with two of the world's biggest piano/vocal cross-over artistsHarry Connick, Jr. and Diana Kralland for his time spent with trumpet titan-jazz ambassador Wynton Marsalis. As a leader, he has released a series of compelling albums and he continues to grow with this release. 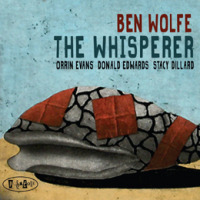 The music on this disc was recorded on two nights in May, 2010 and the program consists of nine wide-ranging Wolfe originals that are tied together by a cohesive group sound from song to song. The album opens with some driving ride cymbal work from drummer Gregory Hutchinson. Pianist Luis Perdomo inserts some idiosyncratic licks between the horn lines from trumpeter Ryan Kisor and tenor saxophonist Marcus Strickland, and then the soloing begins. Solos are capped off with false endings once or twice and Perdomo picks up the pieces during the open-ended section in the middle of the song, bringing the band back together. "For The Great Sonny Clark" deserves instant classic status, with all of the Blue Note-style hard bop hallmarks in all the right places. While Clark's music and spirit might have been a model and inspiration for this particular piece, Wolfe doesn't linger in this land. "Telescope" is fairly straightforward, with Wolfe's walking lines at the core of the piece, but "Contraption" is another story. This piece continually evolves and features some killer trumpet work from Kisor. Wolfe's soloing plays a more important role in the latter half of the album and his work is based more on substance than fireworks. He patiently plies his trade during his solo on "Unjust" and he delivers similarly well-paced performances as the program continues. While Strickland comes on strong earlier on, his sound is soothing and comforting on "I'll Know You More." "Double Czech" is built on some deliciously diabolical, angular bass lines and a little bit of Latin America sneaks its way into the groove on "Coleman's Cab." The latter begins with a soulful, searching bass cadenza with a Charles Mingus vibe to it, continuing on as Wolfe lays down the groove in seven. The inclusion of a sixty second snippet of drum and bass dialogue ("The Trade"), ending with a fade-out, is a strange way to close the album, but that's a small negative in a large sea of positives. The Live At Smalls series brings the music of the club right into the home and this specific release will, hopefully, bring the music of one of today's brightest bass players to the attention of a wider audience.